Interchangeable, snap-on, icons allow this wreath hanger to have a multi-seasonal appeal! Decorate in your own style by adjusting the wreath hanger to the perfect height up to 25 inches. We strengthened our best-selling 10-lb capacity metal wreath hanger and are excited to offer this version with a 20-lb capacity. Just like the popular original, the piece that fits over the door is padded with felt to prevent scuffing the door. PACKAGE CONTENTS: All come with 4 icons and 1 Adjustable Wreath Hanger in matching finish. 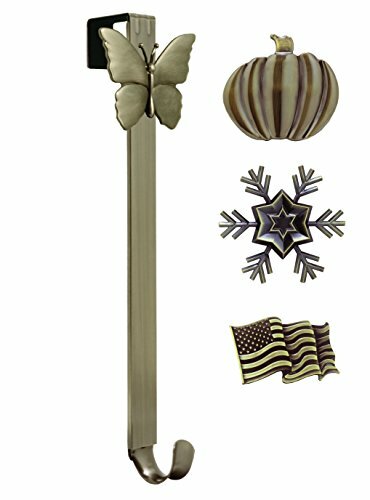 Sturdy metal construction holds even heavy wreaths (up to 20 lbs); Icons made of durable plastic. If you have any questions about this product by Haute Decor, contact us by completing and submitting the form below. If you are looking for a specif part number, please include it with your message.